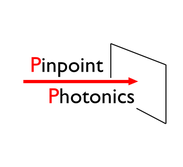 Welcome to Pinpoint Photonics, Inc. Image guided laser pointing technology illuminates the laser light on POI (Point of Interest) area of user. This technology can be easily performed by integration of imaging camera and laser illumination system into one box. This technology is not brand-new technology, it is used in OCT (Optical Coherence Tomography) for ophthalmology diagnosis and laser repair system for LCD panel fabrication. However this technology was born in 1980s and it has longer than 20 years history, application area of this technology is very limited. Pinpoint Photonics, Inc. generalizes Image guided laser pointing technology and provides it to researchers in many applications. Integration of imaging camera and laser illumination system into one box removes frustrating alignment procedure and increases reliability of laser illuminating point. Regarding the method of area selection for laser illumination, both of manual and automating area selection can be chosen. In manual area selection, user selects illumination points by viewing the captured image. When illumination target is specially stained or has distinguishing figure, area for laser illumination can be decided by image analysis automatically. Laser system is decided for each application. Fiber coupling is also available. Image guided laser pointing technology can be applied to both Microscope optics and field lens optics. In case optics supports both of imaging wavelength and laser wavelength, focus point adjustment of laser illumination can be removed when focus adjustment of image observation is finished. Pinpoint Photonics, Inc. does collection of needs and scrutiny of needs at first. Then suitable laser equipment and imaging optics are chosen for products.